1. 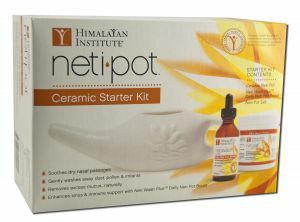 Prepare the saline solution: mix a heaping 1/4 teaspoon of Neti Pot Salt in the Neti Pot with 8 ounces of warm water. Then add one dropperful of Neti wash Plus. 2. Turn your head to one side over the sink, keeping the forehead slightly higher than the chin. 3. Gently insert the spout in the upper nostril so it forms a seal. Raise the Neti Pot so the saline solution flows our the the lower nostril. 4. When the Neti Pot is empty, face the sink and exhale vigorously. 5. Refill the Neti Pot and repeat on the other side. what's a nasal wash used for? A nasal wash can be as routine as brushing your teeth. Use it anytime to: - Wake up, clear the nostrils, and start the day breathing freely. - Remove excess mucus due to congestion. - Rid nostrils of pollen and other allergens. - Cleanse the nasal passages of soot, dust, smoke, or other irritants. - Relieve nasal dryness due to air travel. - Dissolve mucus build-up in dry climates or in heated or air-conditioned rooms. - Improve the flow of breath before doing relaxation or meditation techniques. Remember, a nasal wash is not a substitute for medical treatment. Anyone with chronic inflamation of the nasal passages or other ear, nose, or throat disorders should seek medical attention.